Hello Partners, We’ve been busy ramping up the eBay Daily Deals, and new creative for these top converting offers is now available. These deals are real time, Buy It Now products with free shipping. Typical offers are discounted between 20% and 90% off the original price! The four on-going product deals are backed by major eBay Power Sellers and retail operations like TigerDirect, DealMonger & Buy.com. Expect to see a wide variety of super low priced home electronics, computers, appliances, sporting goods and more. 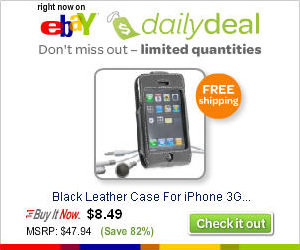 Take a look at the fantastic deals being featured today: http://deals.ebay.com What’s the catch to the Daily Deals? The only catch is that these fixed-price items are in limited quantities. When the item is sold out, it’s gone. It’s important to let your visitors know that if they love an item, they shouldn’t wait and risk losing out on the amazing deal being offered. For showcasing and promoting the Daily Deals, there are several simple to advanced integrations available including static logo size banners, dynamic flash banners, and an XML Data Feed. You can also sign up to receive the Daily Deal email alerts to stay on top of the Deals being featured. Remember that buyers are more conscious than ever of their spending habits, and are trying to find the best bargains online. This is the perfect opportunity to take advantage of that by showing them the Daily Deal, and the countless other great Deals you can find on eBay everyday! Currently only available for the US, but other country programs are coming soon.